Over 10 years ago Karl D. Speak, the founding principal of Brand Tool Box and Broadview, set out to find a way for individuals to use the wholesome principles of business brand building to build a stronger personal brand. His focus was to provide individuals with a set of practical, proven tools to be more of who they are and not less. Authenticity is a brand’s most prized asset. Learning to get credit for one’s authentic qualities is the goal of personal brand building, as Karl sees it. Based upon this simple principle Broadview developed a set of practical personal brand tools. Thousands of individuals from around the world have used our personal brand tools over the past 10 years. In this second edition of their classic book on personal brand, David McNally and Karl D. Speak show that developing a personal brand is not about constructing a contrived image. Rather, it is a process of discovering who you really are and what you aspire to be. The hallmark insight of this new edition is that the best way to establish a strong and memorable brand is to make a positive difference in the lives of others through making lasting impressions that build trusting relationships. McNally and Speak take you through the process of identifying the key components of your brand, conveying that brand to the world, checking how closely your brand aligns with important relationships in your life – particularly the one with your employer – and accessing your progress along the way. This thoroughly revised and updated edition features new material on how to use social media to build a powerful personal brand and case studies of individuals whose personal brands have changed the world. For more information about Be Your Own Brand and to learn more about personal brand, hop on over to our parent company’s website. 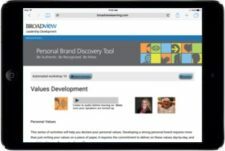 The Broadview Personal Brand Discovery Tool is a powerful self-paced e-learning personal development tool. The unique, interactive development tool guides you through a personalized learning experience to identify the qualities that are truly authentic to you; measure with statistical accuracy how your authentic qualities are perceived by others; and use a set of personalized action-learning tools to more consistently lead with authenticity. The purpose of this development tool is to provide you with the tools that will enable and encourage you to be more of who you are and support your desire to be respected as a leader and team member who acts with authenticity. For a complete description of this product, check it out here!